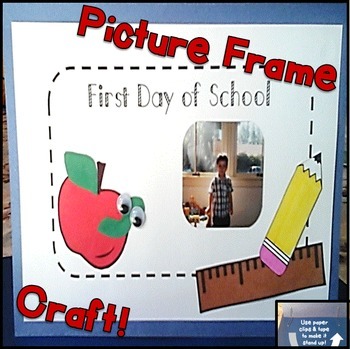 Here is a great craft to get you started on the first day of school! There is also another option to title it "School Days," if you prefer. It is a cut and paste activity that results in a memorable first day of school keepsake that parents will cherish. 1.Choose the frame you’d like to use (first day of school or school days), and run a class set on white construction paper. 2. Run copies of the apples on red, worms & leaves on green, pencils on white, and rulers on tan construction paper. 3. Have students color the pencil & eraser. 4. Depending on your students’ cutting skills, they can cut out the pieces. Or, a parent volunteer could precut them. Students can glue each piece in place. 5. When doing this with kinder, I pass out one piece at a time, & instruct them how to glue each piece one by one. 7. Finally, bend 2 paper clips, and tape them to the back so the picture frame stands up. first day of school ~ behavior chart! first day of school ~ Get Ready for Back to School Night! first day of school ~ Book Organization Labels! Sentence Building ~ Throughout the Year~ BundleEditable Newsletter Templates! Like this product? Pin in it on Pinterest. Become a follower of Peas in a Pod by clicking on the green star on any of our pages. Learn about our new FREEBIES!